Windows users now have a way to wirelessly mirror iPad and iPhone to their computers with AirSever. Similar to Reflection (now called Reflector) for Mac, AirServer is software installed on a desktop or laptop that turns that the computer into an AirPlay receiver with no Apple TV required. There's absolutely no software to install on iPad or iPhone because AirPlay mirroring is built into iOS (but currently only on iPad 2, iPad 3rd generation, and iPhone 4S). AirServer offer a 7 day trial period, though you will have to allow the developer to post on your Facebook wall. 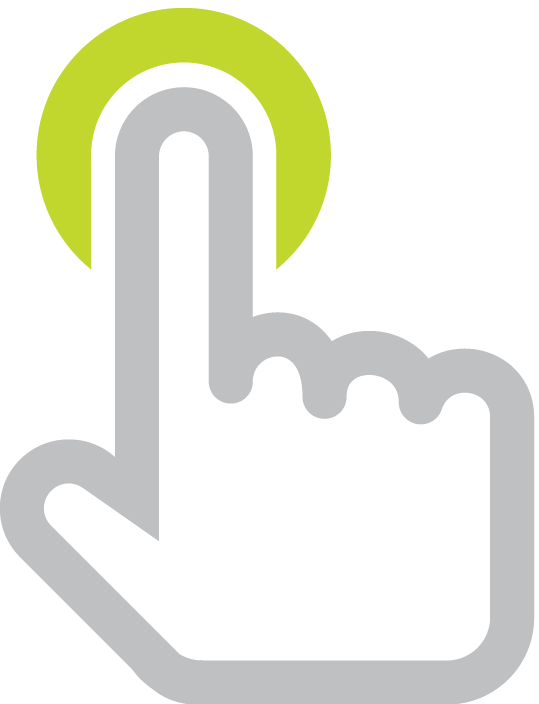 Standard and student licensing costs are very reasonable and can be installed on up to 5 machines. After AirServer is installed on a Mac or PC, your iPad or iPhone must be on the same Wi-Fi network. Then just double-click the Home button on your device and swipe right on the multitasking tray until you see the AirPlay icon next to the volume slider. Tap the AirPlay icon and choose your computer from the list and activate Mirroring. Audio and video from your iPad or iPhone will be routed to your Mac or PC. 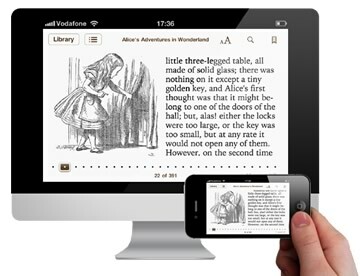 Mirroring allows teachers to show their iPad's screen on a larger computer screen. Better yet, if the computer is connected to a projector, then iPad's screen can be seen by a large audience or classroom full of students. Because AirPlay is built into all iPads (except 1st generation), students' iPads can also instantly be mirrored and their writing, art, ideas, and projects can be shared with the class. Besides using AirServer to show a device's screen to audience, it makes screencasting possible. With software like Jing or Screenr, you can record whatever is on your Mac or PC's screen along with audio. This is a great way to make app tutorials! For an example, check out Prime Number Frayer Model with Popplet Lite by Lisa Johnson. Wirelessly mirroring can turn an iPad or iPhone into a mobile document camera. Simply activate the Camera app while mirroring and what's seen through the camera is piped to the Mac or PC. You might have to be inventive if you want a contraption to hold the device above a surface instead of holding it with your hands. Another use is realtime monitoring of what students are doing on their devices. 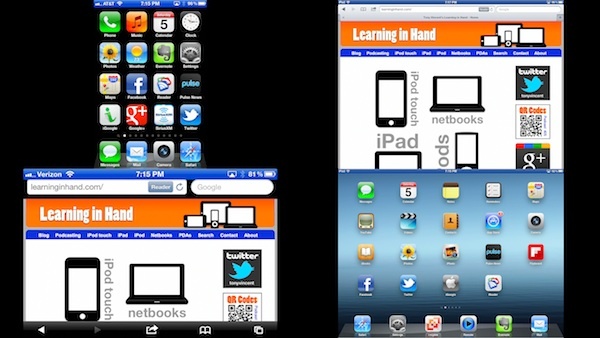 AirSever allows multiple iPads and iPhones to mirror all at once to one computer. Each device that mirrors shrinks the others on the computer's screen to make room. You probably won't want to mirror a whole class set of iPads, but certain students who might be on iPad "probation" may be required to mirror to the teacher's computer for monitoring. The teacher's computer wouldn't be projecting--it would just be for the teacher to oversee what's happening. You might want to know how AirServer compares to Reflection. I have used both and prefer AirServer, mostly because it seems less buggy and scales to take up the entire screen. Furthermore, AirServer's image appears crisper. Reflection does have one option that AirServer does not: Reflection places a cute iPad or iPhone border around your image. Using Reflection is not an option for PCs since it only works in Mac OS X.
Wirelessly mirroring my iPad has greatly improved my workshops. I can walk around the room during demonstrations instead of being tethered to a VGA connection (and I don't have to worry about that pesky iPad VGA adapter constantly falling out). That same improvement can now happen in more iPad-using classrooms thanks to AirSever and its support for Windows PCs. January 2013 Update: Read my new post, Ways to Show Your iPad on a Projector Screen, for a comparison chart that includes AirServer, Reflector, and Apple TV.